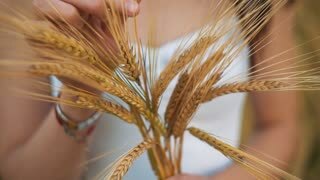 Search Results for "agriculture food production"
the woman in a national white shirt holds in hand the ripened wheat ears on a gold field background. harvest, agriculture, agronomics, food, production, eco concept. Drone aerial shot flying over farm land. Agriculture food production with cinematic movement. Prores file, shot in 4K. Agriculture - food production, planting corn, harvest wheat, tractor working. Aerial footage of a herd of cattle grazing and resting on a fresh, green pasture. Organic, biological, environmentally friendly agriculture, organic food production concept. Bean pods hang from vines and blow in a gentle breeze. Green and purple foliage. Asian agriculture and food production. Farmer agronomist using drone to examine blooming of sunflower crops in field from above, using modern technology in agriculture and food production industry. Agriculture and food production split-screen video wall collage including footage of crops and farm workers in various agricultural activities.